There are animal people, and then there are people who will go above and beyond to give everything they have to help an animal in need. Kitty Martin is an above-and-beyond kind of person. 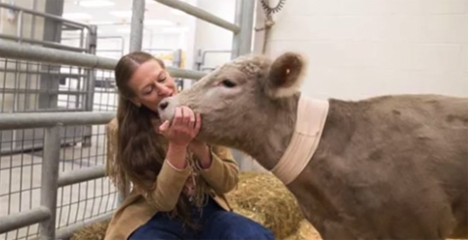 She found a young calf frozen to a field in Virginia, nearly starved to death with its hind hooves lost to frostbite. The retired truck driver jumped into action, calling animal hospitals all over the country to find help for the little calf she named Hero. Hero’s fate was uncertain for a while. He was so badly injured that his veterinary team at first thought it would be best to euthanize him. But Hero lived up to his name and regained enough health to receive his first pair of prosthetic legs. The company that made Hero’s new legs had never made bovine replacement legs before, so they studied cows’ natural gaits to see if they could reproduce those movements biomechanically. It took a while for Hero to get used to his new legs. He was wobbly and unsure at first, but eventually learned to use them almost as effectively as a set of natural legs. 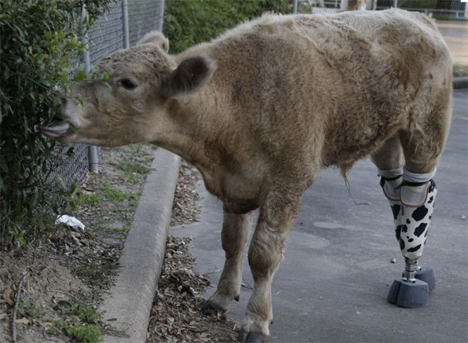 Watching the growing cow totter around on his prosthetic legs is precious and heartbreaking all at once. Since receiving his first pair of legs, Hero has outgrown the prostheses and received a new, larger pair. Although Martin rescued Hero and spent nearly $40,000 on his new legs, she doesn’t plan to make him a house pet. Hero is going to live on a farm in Texas where she can visit him regularly. According to this all-star animal lover, she would like to see Hero work with human amputees as a source of inspiration and companionship. See more in Cybernetics or under Technology. June, 2014.